This came out of nowhere, didn’t it? A new Star Wars animated series… albeit one of shorts! 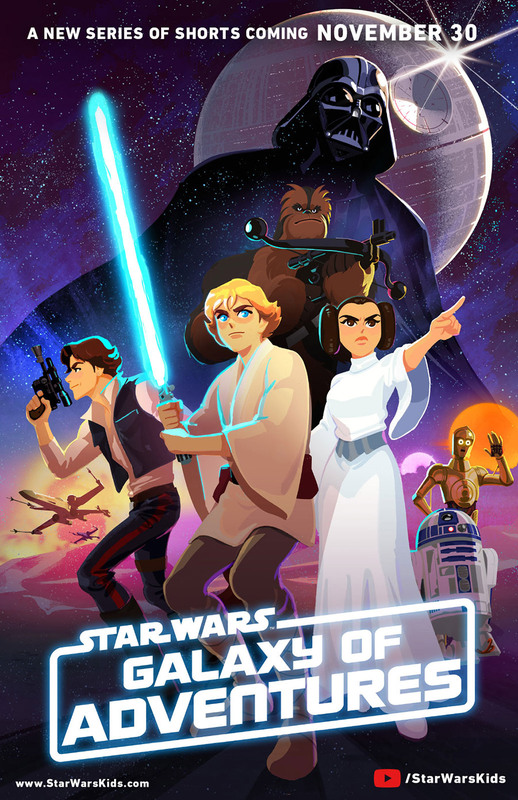 The new series, Star Wars Galaxy of Adventures, is aimed at younger fans of the Star Wars galaxy and is based around, it seems, the original trilogy timeline featuring Han, Vader, Leia, Luke and more. We love the animation style here and hope that we’ll see more of it in the future. Adventure awaits you and the younglings in your life in Star Wars Galaxy of Adventures, a new series of animated shorts that will introduce the classic themes, pivotal moments, and iconic characters from the Star Wars saga to the next generation. Debuting on the all-new StarWarsKids.com and the Star Wars Kids YouTube channel on November 30, the first six shorts combine original dialogue, music, and sound effects with bold new animations, and fun and educational add-ons designed to help older fans, parents, and other mentors to welcome the kids in their lives to explore the galaxy far, far away. Additional shorts featuring fan-favorite characters will debut in December, with regular releases following in 2019. The dynamic animated adventures are only part of a multi-pronged initiative under the Star Wars Galaxy of Adventures banner, and the beginning of a year-long celebration of Star Wars storytelling, which will culminate with the final chapter in the Skywalker saga — Star Wars: Episode IX — in theaters December 2019.